Chinelo Okparanta is the author of Under the Udala Trees (2015) and Happiness, Like Water (2013). 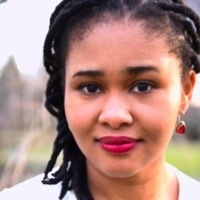 One of Granta’s six New Voices for 2012, she was a finalist for the 2014 Rolex Mentor and Protégé Arts Initiative and was short-listed for the 2013 Caine Prize in African Writing. She is a 2014 O. Henry Award winner, a 2016 Jessie Redmon Fauset Fiction Book Award Winner, as well as a two-time Lambda Literary Award winner for Lesbian Fiction. Her work was nominated for the 2016 NAACP Image Awards in Fiction as well as for the 2016 Zora Neale Hurston/Richard Wright Legacy Award in Fiction. Her stories have appeared in The New Yorker, Granta, Tin House, The Kenyon Review, among others.